We started school three days ago. I have another great group of kids this year. Very interesting I might add too -- 7 kindergarteners! That is a first for me as normally I get small numbers of beginners; too small for serious kiddie stuff. Most of the time they just get to tag along with my other group work doing modified versions. I started my grades 1-3s on guided reading. 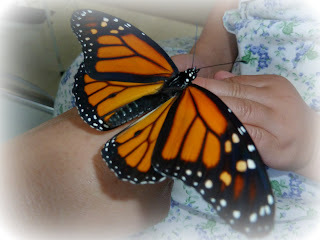 One of the books I did with a group this afternoon was on butterflies including their life-cycles. 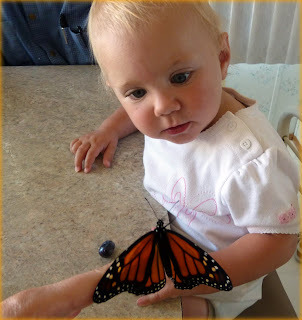 I had to share my experience of collecting caterpillars this summer in South Dakota with my nieces and actually watching the metamorphic cycle. When I got out my camera card, I realized the earlier photos were at home. So here goes; I will organize them so that tomorrow I can just share this post with them. 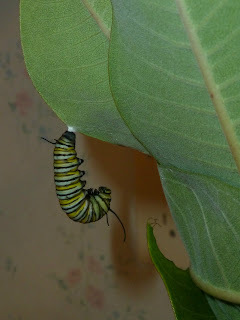 We got a few milkweed leaves with eggs on them. 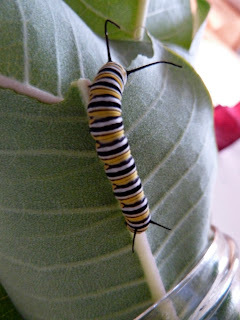 We only kept them around long enough to find one teeny tiny caterpillar a few mm long. 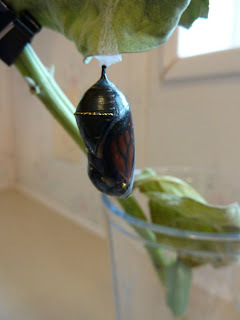 We then got rid of the eggs as we had larger caterpillars to observe. 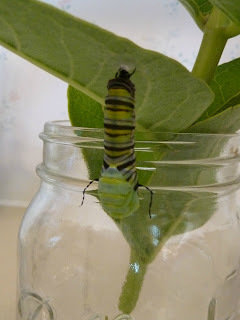 We brought home two caterpillars, one was larger then the other and obviously almost ready for the chrysalis stage. We were surprised how quickly the smaller one grew. 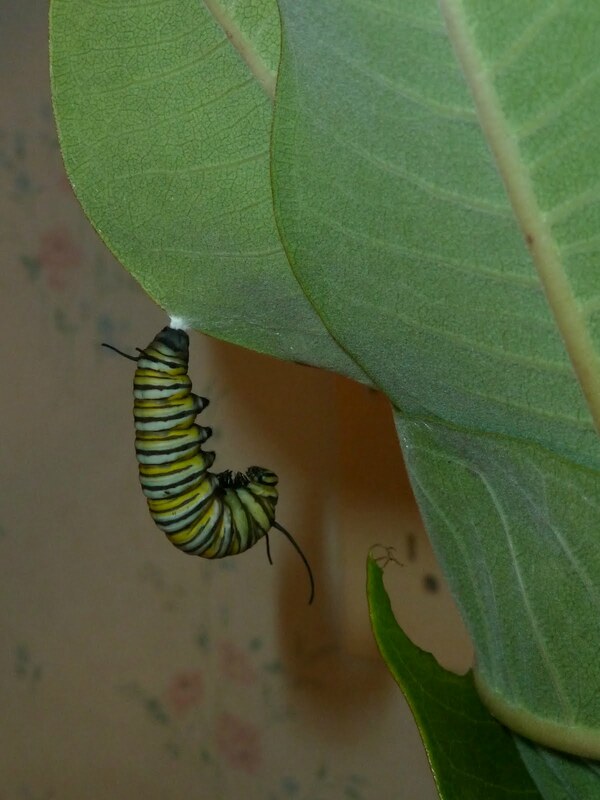 It took about a week for the first to change into the final stage. The caterpillar attached itself on a leaf with (I am told) silk thread! It hung there for a few days (I didn't record how many). We could see the colour changing from vibrant to a murky almost dead-like shade. The next stage really surprised me as I had only seen cocoons before. They were made by moths and not part of the cycle as chrysalises are. 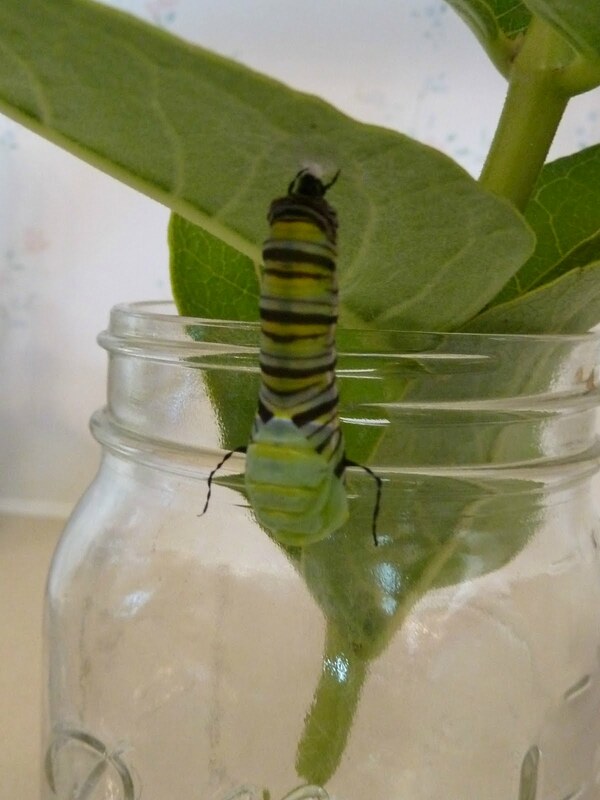 Someone happened to be around and see the caterpillar split its' skin for the last time. The alert was sounded and we managed to watch as it actually wiggled itself out and discarded its' skin. It hung by the silk thread and rotated itself until its shape was the classic chrysalis. The colour was jade green. A pattern of the most beautiful gold appeared within the day. 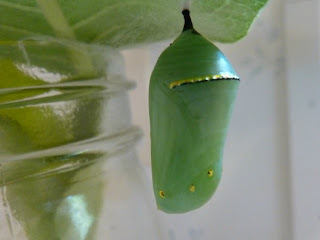 After a few days, the green slowly turned translucent until we could see the developing butterfly inside. 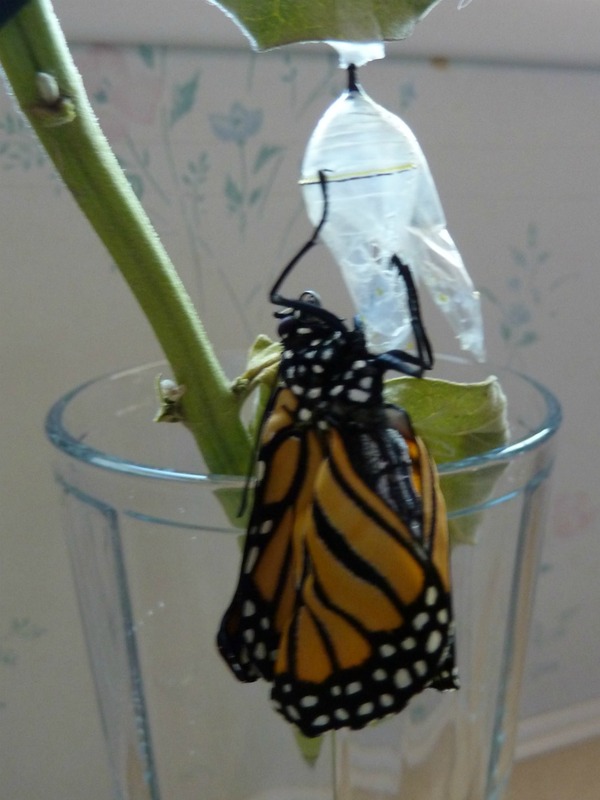 The monarch chrysalis is gorgeous. all crumpled up from its' journey! WOW, now that must have been an experience!!! Teaching the Writing Process- The FUN Way! Apron Lady: Will You Be My Valentine? Getting in the Holiday Spirit with Christmas Games, a Freebie, and a Giveaway!